Learning is rarely fun; it’s even less fun when being taught within the confines of a lecture hall or classroom. While this may be true, there’s no reason why you can’t make the process more entertaining and challenging. 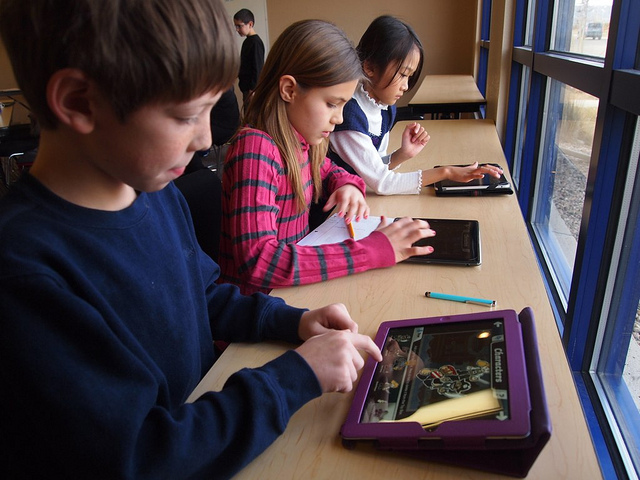 The tablet market has paved the way for educational resources in the form of slick, new apps, with text-books now being replaced by online downloadable versions of themselves. An array of stunning apps are at your disposal waiting to be exercised, so with this in mind, we decided to whittle down our top 10 iPad educational apps for students. It seems wherever you look nowadays, there’s Evernote. The popular organisational app can’t do any wrong with its slick interface and free storage. Its ability to work on all platforms and devices makes it simple to create, curate and capture notes in a simple and intuitive way, which makes it a must-have app for students of all ages. I, for one, used it for my own dissertation not too long ago and boy, did I need it! Winner at the 2012 Apple Design Awards for Best iPad app, Paper has taken creativity of app development to new heights. Fiftythree’s visually stunning app has garnered many fans with a whopping 1.5 million downloads within the first two weeks of release. Whether you’re a designer or a novice, Paper delves in to your inner artist allowing you to express yourself with the help of creative tools and filters. It also makes for great storyboarding, presentation and brainstorming tool. The possibilities of what you can create are endless. You could be forgiven for thinking Goodreader as just as a PDF reader for the iPad. Yes, you can read PDFs, but that just happens to be only one weapon in its arsenal. Goodreader’s ability to import and view any file type, be it text, audio or movie is impressive and the elegant file management with FTP server makes accessing your files a breeze. You’ll find this one utility app will do the job of many. Famous for its pen graphic tablets, Wacom’s first foray into the app market is quite an impressive one. It’s stuck to its trademark of pressure-sensitive products and has created a note-taking productivity app ideally suited for students. With the help of a stylus, make the most of your own natural handwriting by sketching and annotating notes, import images and then print, save or email to share work with fellow colleagues for slideshows, brainstorming sessions and presentations. Writers just want to write and there’s no better way to hone your literary skills than using a non-formatting text editor. Enter iAWriter. Much like the desktop version, the iPad app follows suit by containing no formatting features at all. Its minimalist approach has found a fan in many (myself included) and its ‘stripped-away’ look and feel provides you with the level of focus and concentration you crave, without any distractions. Featuring iCloud support, you are now able to sync seamlessly with your Mac or iPhone, and Dropbox integration enables you to save your work straight from the app with a minimum of fuss. There’s no shortage of note-taking apps for the iPad, so when it comes to searching and finding the gems through the rubble, it can be quite gruelling. Thankfully, SimpleMind is an app that stands out for its ease of use and simplicity. We all need an app which we can open and use within seconds and that’s where this app comes into play – it’s clean, concise and no-nonsense. Ah, referencing! The term itself brings a shiver down the spine of students everywhere. Only if there was an app that would could do it for you. Well, lucky for you there is! Easybib enables you to create accurate MLA, APA and Chicago style citations by just scanning the barcode or typing in the name of the book. Export and email your reference list and add it to your report. Job done. Quite easily the most impressive school planner app available, iStudiez Pro is designed to help you plan your lessons, assignments and deadlines, with ultimate ease – not to mention it looks and behaves just like a real notebook. Integration with iCal is cool and native apps for both the iPhone and Mac will enable you to sync your data wirelessly and keep you on track. Visually stunning and aesthetically satisfying, Wordflex Touch has taken the English Oxford Dictionary to the next level. It utilises the iPad’s multi-touch gestures to great effect, allowing you to explore words, meanings and phrases by re-arranging them and creating new on-screen workspaces. The interactive dictionary maximizes learning with its clever and intuitive approach and its addictive nature will please students of all kinds. You can see quite easily why Star Walk won the 2010 Apple Design Awards for best app. It’s everything you would want in an app; easy to use, beautiful to look at and is the very definition of innovation. Did I mention it’s an educational app as well? Point your iPad towards the sky and discover stars, constellations and satellites in real time. It makes it ideal for astronomy students and anyone who has an interest in the sky at night. Hell, even if you don’t like astronomy, you will after using this app. If there any apps you feel that should have made the list, do let us know by leaving a comment. Don’t miss our round-up of The Best iPad Apps of 2012 so far.